We spoke about gravity earlier. We explained that gravity holds you to the Earth. Gravity holds the Earth in orbit around the Sun. Even other stars effect our Sun and pull it into the Milky Way galaxy. Now you need to think about the combined gravity of an entire galaxy. The gravity of one galaxy can pull on nearby galaxies and eventually form clusters of galaxies. Most of the gravity that attracts galaxies to each other comes from unseen particles called dark matter. Astronomers use radio telescopes to study galaxies because radio waves can sometimes travel farther than visible light waves. With radio telescopes they have discovered that galaxies group together. Sometimes galaxies even run into each other and merge to become larger galaxies. Astronomers started to use radio telescopes in the 1930s to study the Milky Way. Clusters are defined as regular or irregular clusters. The term describes the arrangement of galaxies within the cluster. 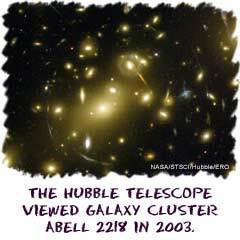 A regular galaxy cluster is spherical with more galaxies towards the center of the cluster. An irregular shape doesn't have main group in the center. Irregular clusters are also smaller than regular ones. No matter what type of cluster, you need to know that they move and change very slowly. Some astronomers believe that galaxy clusters change at about the same pace as the universe because they are so large. There are times when galaxy clusters begin to group and form superclusters. Superclusters have around 10 smaller clusters. These superclusters can span huge distances, reaching a known size of about 3x1024 meters or three trillion trillion meters. You are about 1.5 to 2 meters tall. That's a pretty big group of stars.